They might appear as the flame is detached from the nozzle, but that's in essence merely an illusion and the burn is there, all over the plume of the nozzle exhaust. It is however nearly translucent due to high purity of cryogenic propellants and by the chemical reaction producing molecules having high translucency. Visibility of the plume, unless you're launching at night, has actually little to do with its burn. The burn itself, as the propellant components react (fuel with the oxidizer) will be mostly in the non-visible spectrum with propellants that don't use additives / fuel impurities to shift the heat radiation to the visible spectrum. You have answered yourself why the flame appears invisible to the naked eye, but you didn't mention why it appears to be separated from the engine's nozzle, as per your question. 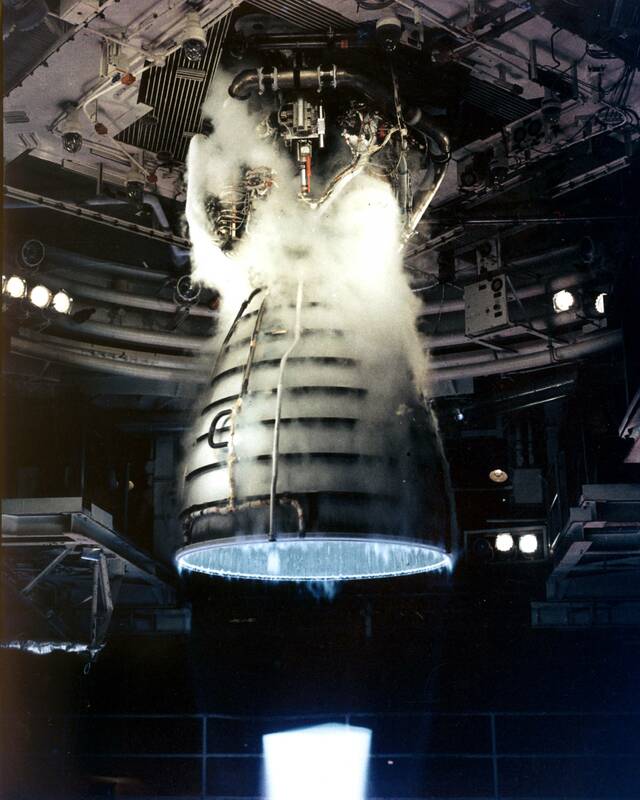 Both images you attached to your question, judging by the color of the exhaust plume and light refraction, use LOX/LH2 or liquid diatomic oxygen O2 and liquid diatomic hydrogen H2 in 1:2 ratio as their oxidizer + fuel propellant components, producing superheated but pure water H2O at the nozzle exhaust, and unless these plumes combine with atmospheric or propellant impurities, they will appear nearly translucent, especially given the pressure they're ejected from the nozzle injectors into the expansion chamber, where they combine. If you look closely at the images you attached, you'll however still notice a somewhat typical light refraction of water at the test facility railings behind them, more pronounced on the top photograph. Rocket plume varies depending on the rocket engine, design altitude, altitude, thrust and other factors. Carbon rich exhausts from kerosene fuels are often orange in color due to the black body radiation of the unburned particles, in addition to the blue Swan bands. Peroxide oxidiser based rockets and hydrogen rocket plumes contain largely steam and are nearly invisible to the naked eye but shine brightly in the ultraviolet and infrared. Plumes from solid rockets can be highly visible as the propellant frequently contains metals such as elemental aluminium which burns with an orange-white flame and adds energy to the combustion process. Some exhausts, notably alcohol fueled rockets, can show visible shock diamonds. These are due to cyclic variations in the plume pressure relative to ambient creating shock waves that form 'Mach disks'. 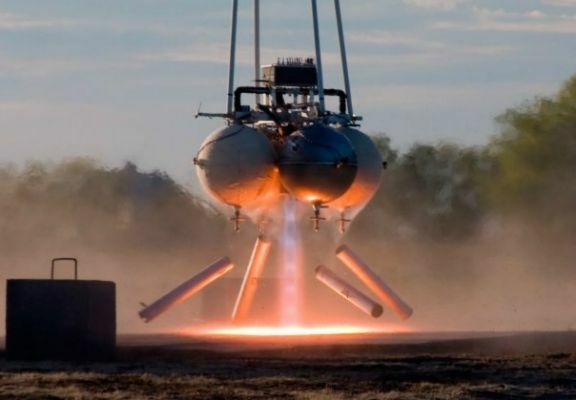 The shape of the plume varies from the design altitude, at high altitude all rockets are grossly under-expanded, and a quite small percentage of exhaust gases actually end up expanding forwards. In short, the answer to the question is not exactly in the burn itself, since these bands, walls, and any other shapes that form within the plume as a result of a backpressure would do that just as well, if there wasn't any burn to start with. It is due to light refraction and high pressure, high velocity ejecta forming walls travelling at the opposite direction each side of the wall (detached burn), or because of the jets intersecting (diamonds). What you see is the first Mach disk (a standing shock wave), which causes a sudden increase in temperature, pressure, and density. At the nozzle exit, the exhaust gases have a comparably low temperature due to the high expansion ratio. 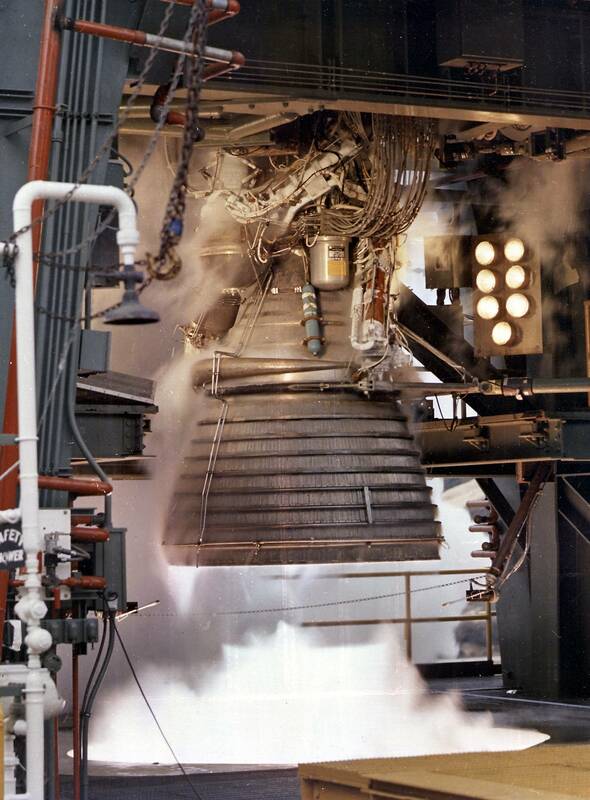 In case of your SSME, the temperature is about 1200 K. The hydrogen-oxygen flame plume does not soot, and the water vapor or the other combustion products are not hot enough to radiate in the visible. Over the shock, the temperature jumps above 3000 K, which causes thermal excitation of the water vapor. You can sometimes see this as a faint reddish glow. The origin of the dominant broad-band blue radiation from hydrogen flames is actually unclear. Most likely, it is a chemiluminescence recombination of radicals present in the plume. This is suddenly enhanced over the shock because of the high density and temperature, causing a great number of molecular collisions. It's because of black body radiation; as the temperature increases the maximum light wavelength gets shifted to ultraviolet (near blue) regions which humans cannot see. Hydrogen flame, like alcohol flame emits little visible radiation but yet emits UV radiation. With increasing oxygen supply, less black body-radiating soot is produced due to a more complete combustion and the reaction creates enough energy to excite and ionize gas molecules in the flame, leading to a blue appearance. The spectrum of a premixed (complete combustion) butane flame on the right shows that the blue color arises specifically due to emission of excited molecular radicals in the flame, which emit most of their light well below ~565 nanometers in the blue and green regions of the visible spectrum. Not the answer you're looking for? Browse other questions tagged rockets fuel engines nozzle burn or ask your own question. Are rocket exhaust flames ever opaque? What causes those curtain-like hot and cool spots in the 2nd stage nozzle of this Electron ELaNa 19 launch?